Court made waves more than a year back when it was screened at the Venice and Mumbai festivals, and was honored with the National Award for Best Feature Film, which is amazing for a debut feature. After having watched I can say it's worth the hype. To be frank, it's not for the impatient or people that insist on a dramatic experience. In the film, a social activist (Vira Sathidar) is arrested on charges of having incited a sewer worker to commit suicide with an inflammatory song. The film mainly deals with the proceedings of the trial of this individual. But the script is not focused on the activist character, who in most part is a silent or monosyllabic cipher. Nor, unlike what we usually see in Indian movies, are the trial proceedings a showcase of verbal fireworks. In fact many a time, we see the trial played out with the context of the other proceedings of the court. We see how a court moves from one case to another, making a quick decision in one, postponing another, the debates about whether or not an accused can be given bail in the interim between court hearings. 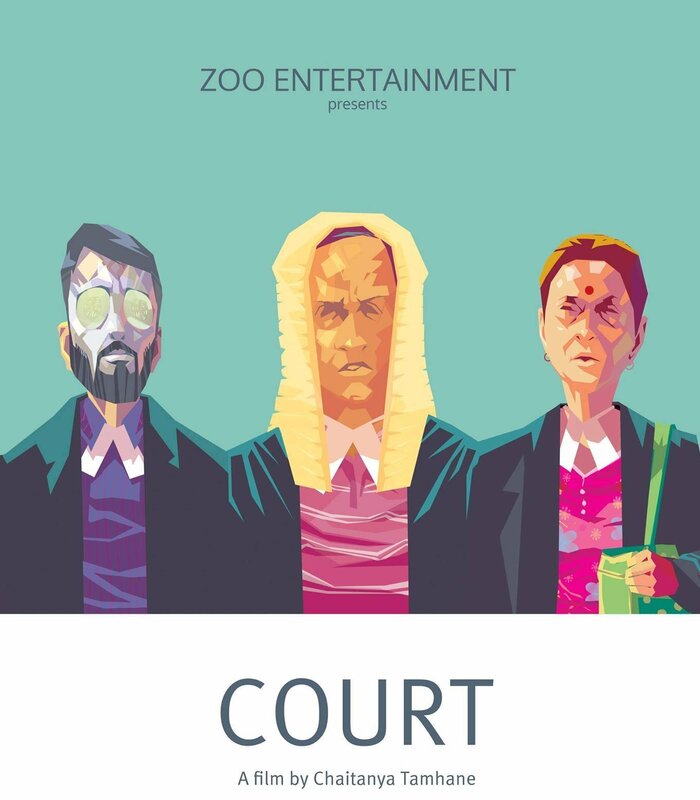 The spotlight is on the major players of the court - the prosecution (Geetanjali Kulkarni), the defence (Vivek Gomber), the judge (Pradeep Joshi). In a conventional film, the prosecution would be presented as evil and the defense as good. Here, both are just doing their jobs. We also get a look into their personal lives, which go on regardless of their professional duties. The defense lawyer is fighting the case as a social cause, but he himself is rather well-to-do, who doesn't think much of dropping a few thousand rupees for an evening at a pub (perhaps he makes his money working for rich clients indulging the social exploitation his activist client is protesting against). The prosecutor is a lower middle-class lady whose idea of an outing is lunch with her family at an Udipi-type restaurant followed by a local drama. She has to worry a lot more about the cost of living, and in that sense is closer in lifestyle to the accused than her counterpart. There are no personal egos involved in their arguments in court, each one is doing her/his own job, at the end of which they go back to their respective lives. The case comes to an end, a verdict is passed, but is that all? No, life goes on, there are and will be new cases, many same as the old cases. The film also has an epilogue dealing with the personal life of the main judge in the case. Again it drives the point that for everyone, life and the court go on. Using many non-professional actors and a very grounded visual style, writer-director Chaitanya Tamhane focuses on the realism and bureaucracy of the institution, and thus makes them come alive in a manner we don't normally see in movies (since mainstream Hollywood also tends to have very glamorized dramatic court scenes). Highly recommended for offbeat movie fans. For the fools like me that didn't catch this at the cinema, Reliance DVD gives a nice A/V presentation of the film (digitally shot), with a decent making of. Watch it.